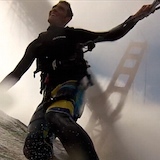 Bay Area Kiteboarding • View topic - BAK + Booicore! For individual orders, please see the forum homepage http://www.bayareakiteboarding.com/forum to purchase a robe in either British Grey or BAK Orange. For a limited time, get a free BAK Spring Trucker with your purchase! For bulk orders including volume discounts and additional colors, please email booicore[at]bayareakiteboarding[dot]com for details. Bump! Just got a fresh order of British Grey robes; these are perfect Christmas gifts!